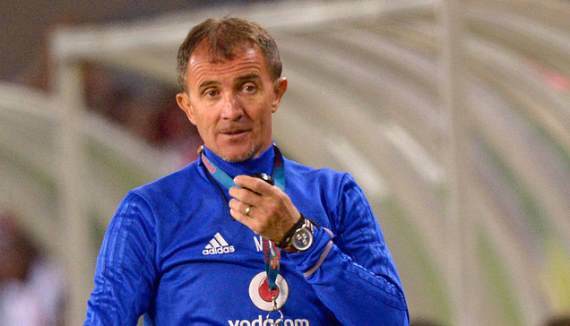 Orlando Pirates coach Milutin Sredojevic says he is delighted to have beaten Kaizer Chiefs three times in 2018 in all competitions. Pirates beat Chiefs 2-1 in Saturday's Telkom Knockout semi-final with Thembinkosi Lorch and Justin Shonga getting the decisive strikes, while Leo Castro got the only goal for the Glamour Boys. Nonetheless, the result means that Bucs have beaten their fierce Soweto rivals three times in a calendar year. In March the Sea Robbers won 3-1 in the second half of 2017/18, before following it up with a 2-1 victory in the Premiership on 27 October this season. As such, 'Micho' is pleased but expects his side to keep on working hard. He told reporters: "When we look behind us we have things to be proud of. "We are looking forward to use, in the best possible way, the biggest power given to us and that is to make our supporters happy and proud of us. "I would say special dedication to our supporters that they have been with us through thick and thin."